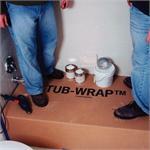 Tub Wrap is the best tub protection available. Protects tubs from scratches, dirt, overspray, nicks and dents. The BEST tub protection on the market! TubWrap for 3 Ft. Shower Pan - 36" x 36"
TubWrap for 4 Ft. Shower Pan - 45" x 30"
TubWrap for 4 Ft. Shower Pan - 48" x 34"
TubWrap for 4 Ft. Shower Pan - 48" x 36"
TubWrap for 42" Shower Pan - 42" x 42"
TubWrap for 48" Shower Pan - 48" x 48"
TubWrap for 5 Ft. Shower Pan - 56.5" x 34"